The Missouri Tigers baseball team has been extremely consistent in a lot of different ways this year. One of those ways has been losing, as the Tigers dropped their seventh of eight Saturday to No. 4 Vanderbilt. Redshirt senior Reggie McClain was on the mound for the Tigers and was dominant all game long. McClain only allowed four runs and struck out nine batters, which was just two away from his career high. Mizzou’s bats helped out as well, getting the offense going early in the third inning. Vanderbilt’s Jordan Sheffield allowed two walks and a hit batter, which loaded the bases in the third. Junior Jake Ring stepped up and hit a single to left, driving in two runs. Sophomore Trey Harris followed up with a sacrifice fly, giving Missouri the early 3-0 lead. In the fourth, multiple hits by the Commodores allowed them to load the bases as and knock in three of their own, evening the score at three apiece. In the bottom of the fourth though, senior Zach Lavy smacked a triple to right, scoring two runs to reclaim the lead. Following his triple, a wild pitch sent Lavy home, giving the Tigers a 6-3 lead. Everything went downhill for Mizzou from there. 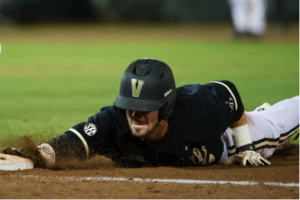 After Vanderbilt tacked on another run in the sixth to shorten the lead to two, its offense turned it on in the top of the ninth. With only one more out to close the game and send the Tigers home victorious, Vanderbilt’s Tyler Campbell ripped a single off redshirt freshman Liam Carter. Two more singles and a wild pitch tied the game at eight, which then opened the door for junior Bryan Reynolds to blast a two run homer and give the Commodores the 8-6 lead. Mizzou was shut down after that, as it had a quick three-out bottom half of the ninth, sealing the Vanderbilt win.